Global headwinds placed India’s balance of payments under pressure in H1:2018-19. While the impact of sharp rise in oil prices was discernible in widening of the current account deficit (CAD), policy tightening by the US Federal Reserve and strengthening of the US dollar led to massive FPI outflows. As the CAD exceeded net financial flows, there was a drawdown of reserves. Estimates suggest that CAD in H1:2018-19 was higher than the sustainable level. The Indian rupee, too, came under pressure and depreciated in both nominal and real effective terms. The first half of 2018-19 (i.e., April-September or H1) was marked by significant shifts in the global economic environment. Impulses of global growth peaked and appears to be weakening across several geographies. Even as external demand shed some of the robust momentum achieved a year ago, intensifying trade wars took their toll and with the maturing of the cyclical upturn that had commenced in mid-2016, the global trade slumped to 13 month low in August 2018. Meanwhile, staccato spikes in international crude prices in January and May solidified into a surge that took them to a 47 month high by early October. For net energy importers like India, this translated into sizable increases in oil import bills with adverse implications for their current account balances. India’s domestic coal shortages in the power sector were met through imports. Furthermore, a number of import items were subject to higher tariffs either to reduce dependence on imports or boost domestic industry. Global financial conditions tightened for emerging market economies (EMEs) across the board as a combination of interest increases and the ongoing balance sheet normalisation by the US Fed, geo-political tensions and EME-specific ‘left tail’ events spread risk aversion, resulting in massive portfolio outflows from their capital markets. In these turbulent global conditions, the Indian capital market was no exception and faced sizable FPI outflows in H1:2018-19 despite the increase in the investment limit and easing of norms relating to minimum residual maturity requirements and security-wise limits in the debt market. This article seeks to mirror these global and domestic developments in an analytical exposition of balance of payments (BoP) outcomes in H1:2018-19. It attempts to focus on specific factors that shaped health of India’s external sector during the period in the Indian economy’s interface with a challenging global environment and the key forces that can impinge on external sector stability going forward. The rest of the article is divided into four sections. Section II provides a detailed analysis of various components of the current account. Section III discusses external financing patterns through major functional categories of the capital and financial accounts. Section IV discusses BoP analytics from the perspective of the sustainability of external debt and the net international investment position. Section V discusses movements in effective exchange rates of the rupee and Section VI concludes by highlighting the potential balance of risks around the evolution of India’s BoP. The current account covers all transactions that directly satisfy economic needs and are distinguished as goods and services trade, receipt or payment of income from investments (primary income), and unilateral transfers (secondary income). By the national accounting identity, current account is definitionally equal to the net inflow of resources into the economy from abroad and the mirror image of the gap between gross domestic saving and investment. Historically, India has run a current account deficit (CAD), largely driven by merchandise (goods) trade deficit and partly offset by net exports of services and net receipts in the secondary income (transfers) account. In H1:2018-19, India’s CAD at US$ 35.1 billion surged to a four year high of 2.7 per cent of GDP (2.4 per cent in Q1 and 2.9 per cent in Q2 of 2018-19) from 1.8 per cent a year ago. As this section points out, this reflected a burgeoning trade deficit and higher net outgoes of primary income. Buoyant net export of services and remittances partly offset the impact (Chart 1a and 1b). Cross-border transactions in goods and services are outcomes of production activities (IMF, 2010). 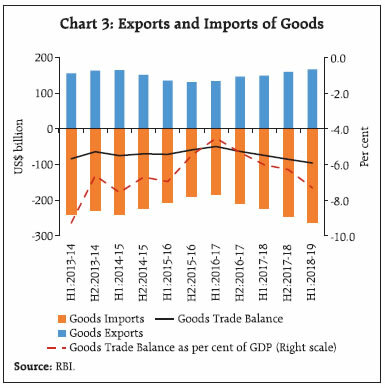 With India being a net importer of goods from the rest of the world, the merchandise trade balance has been a major factor in determining the viability of India’s BoP over the years. It is in this context that the sharp widening of the trade deficit in H1:2018-19 under the brunt of surge in international crude oil prices emerges as a distinguishing feature against the backdrop of recent BoP developments, with implications for the CAD and its financing. On the exports side, India’s shipments picked up – both sequentially and on a year-on-year (y-o-y) basis – in H1:2018-19 notwithstanding the slowdown in global trade. Information compiled by the Directorate General of Commercial Intelligence and Statistics (DGCI&S) indicates that the improvement was led by non-oil sectors, viz., engineering goods, chemicals and drugs and pharmaceuticals. Exports of petroleum products expanded too, supported by higher international crude oil prices. Shipments from these four sectors together contributed 84 per cent of total export growth. Among the major destinations, the United States (US), the United Arab Emirates (UAE), China, Hong Kong and Singapore absorbed 37.4 per cent of India’s exports in H1:2018-19. Import growth was robust attesting to the underlying strength of domestic demand and was mainly driven by petroleum (crude and products), coal, electronic goods, machinery and chemicals. Higher imports of petroleum and coal essentially reflected elevated international prices. India’s goods trade deficit turns out to be highly correlated with trends in international crude oil prices (Chart 2). In terms of comparative statics, a one US$ increase in the international price of crude oil per barrel expands the merchandise trade deficit by US$ 1.25 billion. This calculation is contingent upon the level of the prices of crude. Fuller implication of crude prices for the BoP on a whole would need to take into account the underlying sensitivities of services, remittances and some components of capital flows to oil price changes. 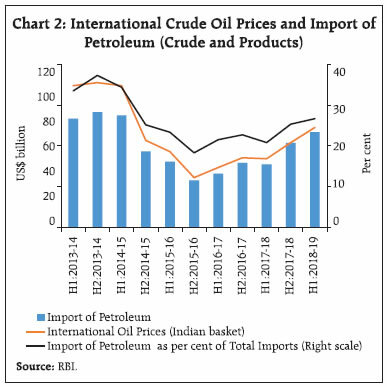 In H1:2018-19, there was a y-o-y rise of 46 per cent in international crude oil prices. Consequentially, net oil imports constituted three-fourth of the expansion of trade deficit of US$ 21.4 billion on a y-o-y basis. Among other imports, there was a sharp rise in coal imports due to increase in both volume and international prices. Notwithstanding higher domestic production, demand-supply gap persisted in coal sector and import volume of coal rose to meet supply shortages for the power sector. Despite increase in tariff on various electronic items in recent years, electronic goods imports recorded double-digit growth and accounted for one-third of the merchandise trade deficit in H1:2018-19. A sharp increase of 25 per cent in imports of machinery was in line with pick-up in domestic investment activity. Gold imports – the fourth largest item in the import basket – remained subdued by the softening of international bullion prices, despite an increase of 9 per cent in volume. Among items which were subject to higher tariffs during the period, imports of edible vegetable oil recorded a fall of 16.3 per cent. Of the major sources of India’s imports, the largest contributions to growth emanated from the USA, Saudi Arabia, the UAE, Iraq, Hong Kong and Iran. With import growth (17.4 per cent) exceeding export growth (11.8 per cent), the merchandise trade deficit widened to 7.3 per cent of GDP from 6.0 per cent a year ago (Chart 3). Elevated international commodity prices, particularly of crude oil and coal, imparted an adverse terms of trade (TOT) shock to India’s trade account in H1:2018-19. Net TOT are estimated to have been eroded by 1.8 per cent during the period or 0.8 per cent of GDP. In the absence of this shock, the trade deficit would have been narrower by US$ 10 billion in H1:2018-19 (Chart 4).1 It is estimated that 90 per cent of the trade deficit was driven by changes in gross TOT (i.e., import volume growing faster than export volume) and remaining by losses in net TOT. Notwithstanding these adverse shocks and escalating global trade tensions, India was able to preserve its market share in world exports at 1.7 per cent in H1:2018-19. A decline in the revealed comparative advantage (RCA) for a few products/sectors points, however, towards diminishing comparative advantage even as India has been able to maintain its advantageous position in its top 5 export sectors. Similarly, a decomposition of changes in India’s export market shares reveals that while push factors were important in driving the change, it was also impacted by change in product and geographical mix (RBI, 2018). An enduring stability in net earnings from services trade has shored up India’s current account by partly offsetting the goods trade deficit over the years. According to the World Trade Statistical Review 2018 of the WTO, India was the 8th largest exporter of services in the world in 2017, though export performance has remained relatively skewed towards software exports, reflecting cost competitiveness of Indian companies in providing IT services (Chart 5). Despite a challenging global business environment facing Indian IT companies, software services exports rose by 7.4 per cent in H1:2018-19 buoyed by US spending on technology, revival in banking, financial services and insurance (BFSI) segment and renewal of deals. Broad-based demand across key industry verticals like BFSI, retail and manufacturing & technology and gradual diversification into advanced technological segments of cloud computing and analytics supplemented the recovery process for major companies. In 2017, India contributed 10.4 per cent in global exports of telecommunications, computer and information services (WTO, 2018). Moreover, the rupee depreciation also supplemented higher net margins for these companies during this period. 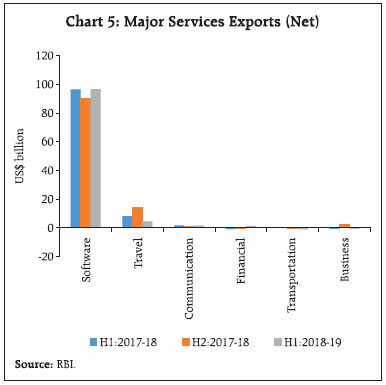 Turning to outgoes on the services account, payments for imports of travel services grew sharply relative to exports causing net export earnings generated by this sector to fall by 42.0 per cent in H1:2018-19. Incidentally, sluggish growth in foreign tourist arrivals impacted export earnings from travel services. On the payments side, both outbound tourists and per capita expenditure have increased in recent years, and a large proportion of travel expenses was for the purpose of higher education in key destinations such as the US, the UK, Australia and Canada. Likewise, growth in imports of transportation services, primarily on account of higher freight payments, exceeded export growth, making this sector a net importer from being a net exporter in H1:2017-18. Within business services, net export earnings from R&D, professional and management consultancy improved, though the deficit in technical and trade related business services persisted in H1:2018-19. 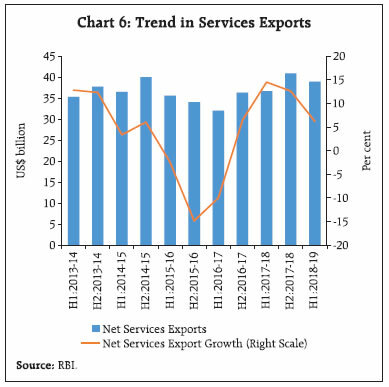 Reflecting these developments, net services exports rose modestly by 6.2 per cent in H1:2018-19 over its level a year ago (Chart 6). The primary income account records amounts payable and receivable in return for providing temporary use to another entity of labour, financial resources or non-produced nonfinancial assets (IMF, 2009). Balance of primary income is added to GDP to arrive at gross national income of the economy which measures the aggregate value of the gross balances of primary incomes for all sectors (SNA, 2008). In the case of India, there has been a persistent net outgo from the primary income account, which increased to an all-time high of US$14.6 billion in H1:2018-19 owing to payments of dividend and interest as well as reinvestment earnings (Chart 7). While payments on account of reinvested earnings contributed about one-third of the total income payments, debt servicing of external commercial borrowings (ECBs) and nonresident deposits and dividend payments on stocks of foreign direct investment (FDI) and foreign portfolio investment (FPI) accounted for the rest (Chart 8). 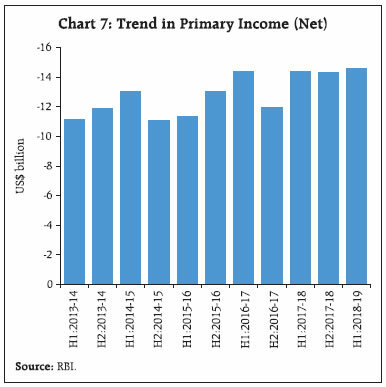 Higher outgo from primary income account is in line with healthy earnings reported by corporate sector in H1:2018-19. As a large chunk of ECBs is raised on a floating rate basis, a sharp rise in LIBOR may have elevated the interest cost paid on ECBs during the period. The secondary income account shows current transfers between residents and non-residents, reflecting the process of income distribution between economies and hence their gross national disposable incomes. In the case of India, secondary income is received mainly in the form of personal transfers (remittances) from overseas Indians. 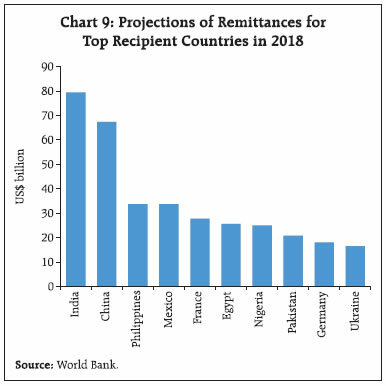 According to the World Bank (2018), India was the top remittance-receiving country in 2018, followed by China, the Philippines, Mexico, France and Egypt (Chart 9). During H1:2018-19, secondary income witnessed a robust growth of around 20 per cent (US$ 36.4 billion) (Chart 10). About 82 per cent of the total remittances received by India are received from seven countries, viz., the UAE, the US, Saudi Arabia, Qatar, Kuwait, the UK and Oman (Jain et al., 2018). In particular, two-third of Indian migrants are in the Gulf countries and, therefore, activity levels in these countries – mainly determined by international crude oil prices – play a critical role in defining the level of remittances (RBI, 2016). 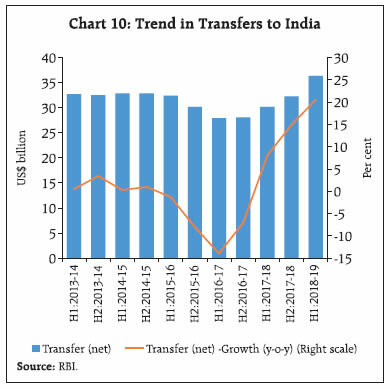 A sharp rise in crude oil prices and depreciation of the Indian Rupee (INR) seem to have augured well for remittance flows to India in H1:2018-19. Similarly, the average cost of sending remittances to India has also fallen in recent years, though it remains higher than the sustainable development goal (SDG) target of 3 per cent by 2030. The widening of merchandise trade deficit and sharp rise in net primary income outgo led to a sharp rise in the CAD in H1:2018-19, though arrested partially by the rise in net services exports and transfer receipts from overseas Indians, marginally crossing the sustainable mark for the first time since H1:2013-14. A deficit in the current account is financed with a corresponding surplus in the ‘capital’ and ‘financial’ accounts of the balance of payments, involving transfers of both non-financial and financial assets between residents and non-residents. 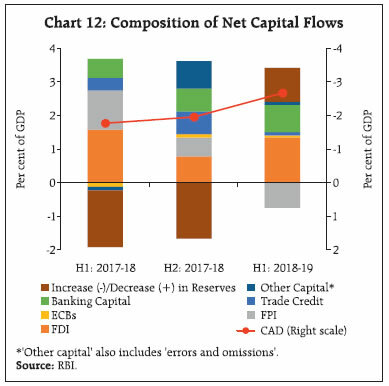 In H1:2018-19, net capital and financial flows could finance only 62.0 per cent of CAD due to reversal in FPI and a slowdown in net FDI flows relative to their level a year ago. Accordingly, the CAD was partly financed by drawing down of foreign exchange reserves during the period (Chart 11 and 12). The capital account, which captures the net acquisition of non-produced non-financial assets2 and other capital receipts recorded a marginal outflow of US$ 3.9 million on a net basis in H1:2018-19 as compared with an outflow of US$ 19.6 million in the corresponding period of 2017-18. The financial account in the BoP records changes involving financial assets and liabilities that take place between residents and non-residents. Flows recorded under major functional categories underwent significant compositional shifts during the period under review. Direct investment is a category of cross border flows associated with a resident in one economy having control over the management of a company that is resident in another economy. Relative to portfolio investment, FDI is considered to be a stable source of external financing in EMEs. Over the last three decades, the investment climate in India has improved considerably. In the last two years alone, India’s rank has improved by 53 positions in the World Bank’s annual “ease of doing business index”. India currently ranks 77th in the list of 190 countries.3 Improvement in terms of various parameters of ease of doing business, (e.g., starting a business, dealing with construction permits, access to electricity, paying taxes and trading across borders) augurs well for stakeholders with a lasting interest in the Indian economy. Based on approvals of greenfield investment projects in 2017 across countries, a recent report by fDi Intelligence (2018) places India at the second place after the US. Net FDI declined to US$ 17.7 billion in H1:2018-19 from US$ 19.6 billion in H1:2017-18. 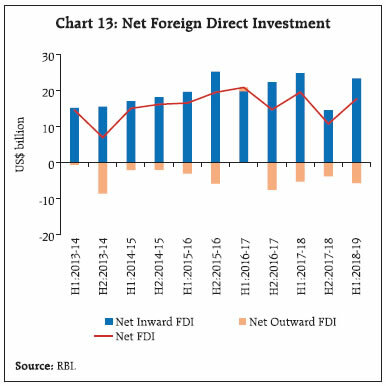 The fall was contributed by both moderation in net inward FDI and rise in net outward FDI (Chart 13). 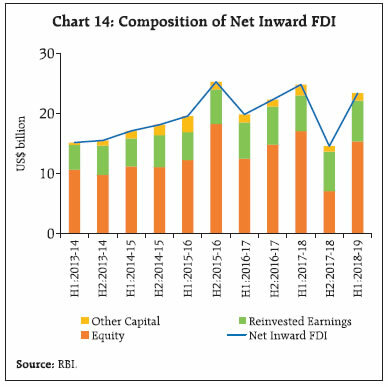 Net flows of FDI in the form of equity recorded a fall of 10 per cent on a y-o-y basis (Chart 14). During this period, FDI in communication services halved from its level a year ago, which was partly offset by an increase in flows into manufacturing and financial services. A comparison shows that India fared better than the global trend in FDI which has been adversely impacted by changes in global economic and policy environment (Box I). Country-wise, Singapore and Mauritius remained top source countries in H1:2018-19. Importantly, FDI equity flows routed through Mauritius declined sharply reflecting the impact of the amended DTAA. Notwithstanding the revised DTAA between India and Singapore in December 2016, the latter remained a top FDI investor in India (Table 1). At global level, FDI flows have lost steam since 2016. The fall in FDI is more pronounced in advanced economies than EMEs. While there has been a general fall in rate of return on investment, moderation in global FDI is also driven by stagnation in growth in global value chains (GVCs). In fact, the growth in GVC participation which is highly correlated with the FDI flows has decreased in both advanced and EMEs. As per United nations Conference on Trade and Development (UNCTAD) estimates, the global FDI flows fell by 41 per cent in H1:2018, notwithstanding an accelerated pace of world output (Chart a). 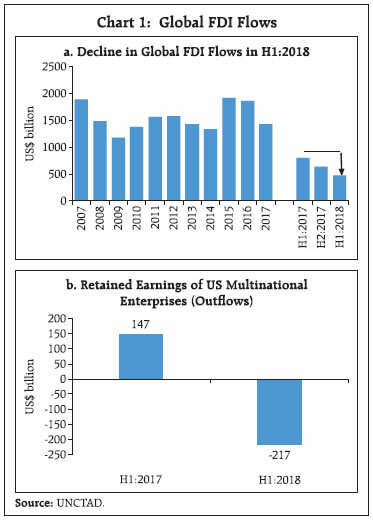 This fall is attributed, inter alia, to large repatriations of retained earnings by US-based parent companies from their affiliates abroad (Chart b). This reversal is evident in the aftermath of the enactment of the US tax reform package at the end of 2017 which gave multinationals a one-time special rate of 15.5 per cent instead of 35 per cent rate on the repatriation of profits earned abroad and also cut the federal corporate income tax rate from 35 per cent to 21 per cent (Financial Times, 2018). Other impeding factors that contributed to the fall in global FDI flows are growing uncertainty about the trade relations between major economies, softening of commodity prices in recent years and more stringent investment screenings in major economies. Financial Times, US tax cut said to have little impact on investment, October 29, 2018. UNCTAD (2018), World Investment Trends Monitor, October 2018. India’s outward FDI has also expanded in line with the simplification of the policy and procedures for outbound investments from India since 2004. In H1:2018-19, rise in net outward FDI was due to a sharp increase in overseas equity investment by Indian entities. Of the total outward FDI, half was directed towards the US, Singapore and Netherlands (Table 2). Indian entities largely invested in sectors, viz., financial, insurance, banking, manufacturing, agriculture, mining and wholesale trading – accounting for 90 per cent of the total outward FDI. Note: Data includes equity, loans and guarantees invoked. In the BoP, portfolio investment is defined as cross border transactions and positions involving debt or equity securities, other than those included in direct investment or reserve assets. As portfolio flows are perceived to be sensitive to global financial conditions and shocks to the domestic economy, they are considered to be more volatile than other forms of capital flows (Pagliari and Hannan, 2017). This was evident in 2018 across EMEs. Net foreign portfolio investment (FPI) flows to India which were buoyant in 2017-18 reversed in H1:2018-19. The outflow occurred despite easing of various FPI norms announced during the period under review, such as (i) increase in the limit for FPI investment in Central Government securities (G-secs) by 0.5 per cent to 5.5 per cent of outstanding stock of securities in 2018-19, (ii) easing of minimum residual maturity requirement norm for FPIs investing in debt securities of central (including treasury bills) and state governments and (iii) increase in the cap on aggregate FPI investments in any G-Sec from 20 per cent to 30 per cent of the outstanding stock of that security. Rising concerns about volatile international oil prices, escalation in global trade tensions, the tightening of US monetary policy, US dollar strengthening and geo-political concerns led to a global portfolio rebalancing away from EMEs, including India. 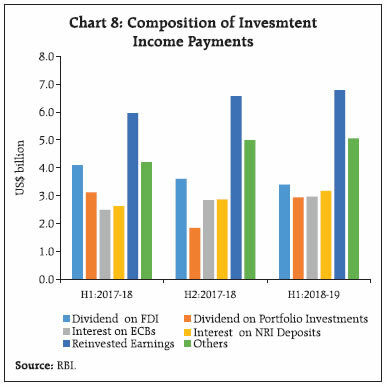 Amid other domestic policy changes, viz., tightening of norms relating to the issuance of participatory notes by FPIs in 2017-18 and re-introduction of the long-term capital gains tax on equity in 2018-19 might also have dented sentiments of portfolio investors as these changes eventually make the returns less attractive. FPIs were net sellers in both debt and equity segments of domestic capital markets, though they turned net purchasers transiently during July-August 2018. In H1:2018-19, on net basis, FPIs pulled out US$ 11.5 billion as against a net purchase of US$ 14.4 billion a year ago (Chart 15). Sector-wise, the highest FPI outflow was from sovereign sector (i.e., G-Secs) with a contribution of 45.4 per cent, followed by banking sector (11.8 per cent), other financial services (15.2 per cent), automobile and auto components sector (14.1 per cent) and metals and mining sector (6.1 per cent). As at end-September 2018, FPI limits for government debt and corporate bonds market were utilised to the extent of 62.1 per cent (i.e., 71.6 per cent in central government securities and 6.4 per cent in State Development Loans (SDLs)) and 75.5 per cent, respectively. A large chunk of FPI stock was held by portfolio investors operating in the US, Mauritius, Luxembourg, Singapore and the UK. Other Investment in the BoP mainly comprises flows relating to ECBs, trade credit and changes in assets and liabilities of the banking sector. ECBs are commercial loans raised by eligible resident entities from recognised non-resident entities. These loans are subject to guidelines on parameters such as minimum maturity, permitted/non-permitted end uses and maximum all-in-cost ceiling. In H1:2018-19, various measures were undertaken to liberalise ECBs which include (i) rationalisation of all-in-cost under all tracks and Rupee denominated bonds, (ii) increased in the ECB Liability to Equity Ratio for borrowings from foreign direct equity holder under the automatic route, (iii) expansion of eligible borrowers’ list and (iv) rationalisation of end-use norms. Net ECBs (excluding inter-corporate loans by affiliated enterprises) were negative during 2015-16 to H1:2017-18 as principal repayments exceeded fresh borrowings. They turned positive, however, since H2:2017-18 and net inflows of US$ 0.8 billion characterised H1:2018-19 (Chart 16). The sectoral distribution of ECB agreements in H1:2018-19 shows that ECBs were mainly raised by entities in financial services, telecommunication services, petroleum and auto accessories sectors. Furthermore, ECBs were raised mainly for the purpose of refinancing of earlier loans, import of capital goods, on-lending and rupee expenditure on local capital goods. The pattern of approvals suggests that 83 per cent of ECBs5 during the period were on a floating interest rate basis. 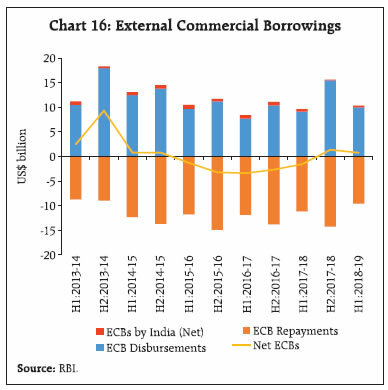 Within ECBs, however, flows of rupee denominated bonds – permitted since September 2015 – were almost negligible in H1:2018-19 relative to their level a year ago. Trade credits are extended for imports directly by overseas suppliers, banks and financial institutions for maturities of up to five years. Depending on the source of finance, such trade credits are classified as suppliers’ credits or buyers’ credits. Trade credit flows declined during H1:2018-19 to almost half of their level a year ago. The RBI discontinued the practice of issuance of letters of undertaking / letters of comfort (LOUs / LOCs) since March 2018 which hitherto were contributing a large chunk of buyers’ credits for imports into India intermediated by AD Category-I banks6. Even though the fall in buyers’ credit was partly substituted by higher suppliers’ credit, it could not offset the gap fully. Accordingly, trade credit to import ratio also fell to 9.7 per cent in H1:2018-19 from 22.6 per cent in H1:2017-18 (Chart 17). Importers might have met trade credit shortages by drawing down rupee resources (i.e., working capital limits) from their banks. 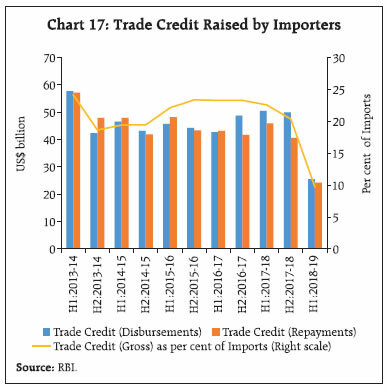 Even though repayments of trade credit also fell sharply, net trade credit declined by 71.6 per cent in H1:2018-19 from their level a year ago. 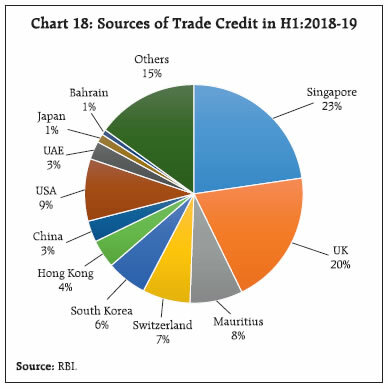 Based on approvals in H1:2018-19, it is estimated that trade credit was mainly sourced from Singapore, the UK, the USA and Mauritius which together accounted for 60 per cent of total issuances (Chart 18). In the financial account, banking capital comprises three components: (a) foreign assets of commercial banks, (b) foreign liabilities of commercial banks, and (c) others.7 Flows under banking capital are mainly driven by significant increase in non-resident deposits and movements in net financial assets held abroad by commercial banks in India. 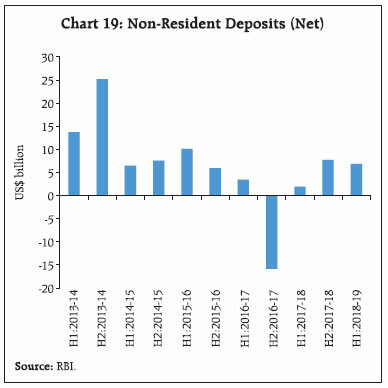 Net flows of non-resident deposits rose vigorously to US$ 6.8 billion in H1:2018-19 from US$ 1.9 billion a year ago, benefiting from depreciation of the INR against the US dollar and improved income conditions in source countries, particularly in the Gulf region (Chart 19). Flows under non-resident deposit accounts were primarily from the UAE, the USA and the UK and Saudi Arabia. 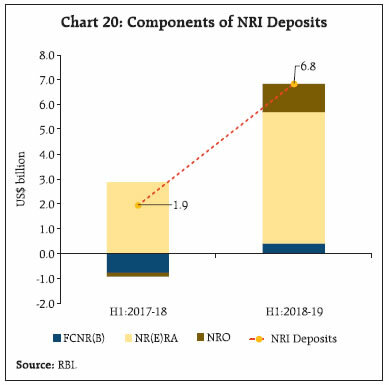 Scheme-wise, deposits under rupee denominated accounts, i.e., Non-Resident (External) Rupee Account (NRE) and Non-Resident Ordinary Account (NRO) contributed 77 per cent and 17 per cent, respectively, of the total deposits made by non-residents during the period under review (Chart 20). As at end-September 2018, 82 per cent of the total outstanding non-resident deposits were rupee denominated and the remaining in permitted freely convertible currencies, viz., US dollar, UK pound, Euro, Japanese yen, Canadian dollar and Australian dollar. Reserve assets are readily available to and controlled by monetary authorities for meeting balance of payments financing needs, for intervention in exchange markets and for other related purposes (such as maintaining confidence in the currency and serving as a basis for foreign borrowing). In India, reserves comprise foreign currency assets (FCA), gold, reserve tranche position in the IMF (RTP) and special drawing rights (SDR) (Table 3). As net capital flows in H1:2018-19 could not fully finance India’s CAD, there was a depletion to the tune of US$ 13.2 billion of the foreign exchange reserves on a BoP basis (i.e., excluding valuation effect) (Chart 21). The foreign exchange reserves in nominal terms (including the valuation effects) decreased by US$ 24.0 billion during April-September 2018 as against an increase of US$ 30.3 billion during the same period of the preceding year. The valuation loss was largely due to the appreciation of the US dollar against major currencies, amounting to US$ 10.8 billion in H1:2018-19 as against a gain of US$ 9.3 billion a year ago. The financing of the CAD and its composition is manifested in movements in external debt and the net international investment position (NIIP).8 In fact, these underlying determinants enable an assessment of reserve adequacy, sustainability of the current account balance and thus the exposure of the economy to risks from external vulnerabilities. where CAB is the current account balance and SFA implies the stock-flow adjustment term which reflects ‘valuation effects’ (net capital gains on holdings of foreign assets and foreign liabilities due to movements in their values and exchange rates) and other changes such as data revisions. where CAB is the current account balance and SFA implies the stock-flow adjustment term which reflects ‘valuation effects’ (net capital gains on holdings of foreign assets and foreign liabilities due to movements in their values and exchange rates) and other changes such as data revisions. stood at 20.8 per cent at end-September 2018, a shade higher than its level of 20.5 per cent at end-March 2018. Other debt profile vulnerability indicators, though somewhat worsened relative to end-March 2018, were stronger than their levels in pre-taper tantrum period (Table 4). 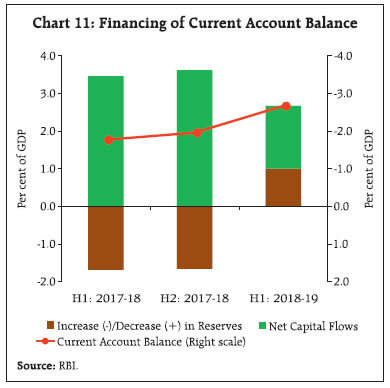 As alluded to in Section III, the CAD was financed by both net foreign capital flows and drawdown of foreign exchange reserve assets in H1:2018-19. In tandem with these changes, Indian residents’ overseas financial assets as well as foreign owned assets in India declined during the period. With the decline in the latter being larger, net claims of non-residents on India declined by US$ 28 billion from their level at end-March 2018 – translating into a marginal fall in net IIP to 16.1 per cent of GDP from 16.3 per cent during the period. The decline in foreign-owned assets in India was driven by fall in foreign direct investment and portfolio investment. Of the total decline of US$ 26.8 billion in Indian residents’ foreign assets abroad, as much as 90 per cent occurred through reduction in foreign exchange reserve assets. In the case of an open economy, developments in BoP also reflect on the changes in demand for or supply of the foreign currency and thus affect exchange rate levels. The exchange rate, when defined in real effective terms, helps measure a country’s overall export competitiveness. Effective exchange rate indices summarise the movement in a country’s bi-lateral exchange rate with its trade partners into an index. Often, these indices depict changes in the external competitiveness of a country’s goods and services based on changes in the exchange rate and better capture the macroeconomic effects of exchange rates than bi-lateral exchange rates. 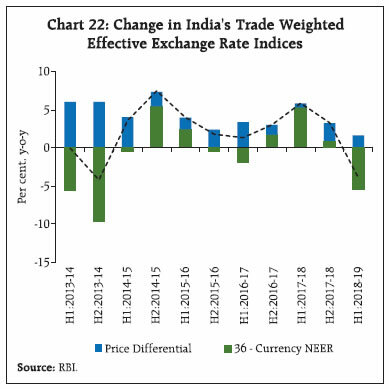 The nominal effective exchange rate (NEER) index captures the change in competitiveness based on movement in nominal bi-lateral exchange rates. The NEER index when adjusted for price differentials across trading partners forms the real effective exchange rate (REER) index. Together, these indices serve as summary indicators in tracking changes in international price/cost competitiveness of the home country. Exchange rate markets were relatively volatile during H1:2018-19 with currencies of peer economies coming under pressure against the US dollar. The ongoing monetary policy normalisation by the US Fed and country specific factors in many EMs gave rise to risk aversion causing retrenchment of assets of these countries by foreign investors. As a consequence currencies of Argentina, Turkey, Brazil among others declined by over 15 per cent during H1:2018-19 (y-o-y). On the whole, currencies with a weight of 41.9 per cent in India’s trade basket depreciated against the US dollar during H1:2018-19 (y-o-y). The Indian rupee, too, came under pressure, trading with a depreciating bias during the period and fell by 6.1 per cent against the dollar (y-o-y) in nominal terms. However, in nominal effective terms the rupee declined by 5.5 per cent during H1:2018-19 (y-o-y) (Chart 22) as some peer economy currencies depreciated more against the US dollar relative to the rupee. 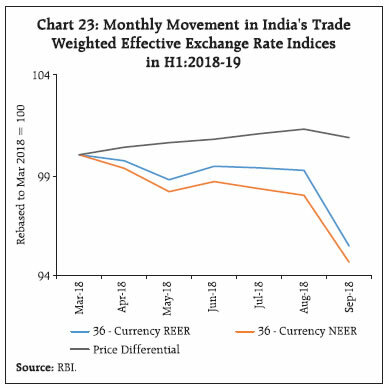 India’s real effective exchange rate declined to a lesser extent (4.0 per cent) during the period as relative price pressures negated some of the nominal depreciation (Chart 23). India’s BoP faced two major adverse shocks in H1:2018-19. First, a sharp rise in international crude oil prices led to a terms of trade loss which had an adverse impact on the trade deficit. Second, outflows of FPIs warranted drawdown of reserves to finance higher CAD. India’s continued dependence on imports for crude oil makes the CAD more vulnerable to the gyrations in international prices. While oil prices have eased somewhat in Q3 of 2018-19 amid uncertainty about the effectiveness of production cuts proposed by OPEC in reining oversupply, the outlook remains volatile. The external environment remains fragile as global growth, trade and industrial activity shed momentum. Nevertheless, the on-going trade war between the US and China and the likelihood of Brexit in March 2019 could offer opportunities for Indian exporters if bilateral trade agreements are renegotiated. Earners of secondary income may be incentivised by reducing the cost of sending remittances through Indian banks operating abroad. However, there are threats from the financing side as monetary policy normalisation and a stronger US dollar pose downward risk for portfolio flows to EMEs. Domestic reforms need to be accelerated to attract FDI inflows even as India improves its rank in terms of the ease of doing business, and is perceived to be less vulnerable among peer economies, given its lower external debt-GDP ratio and better reserve adequacy indicators. Financial Times (2018), Global Greenfield Investment Trends: The fDi Report 2018, https://www.fdiintelligence.com/Landing-Pages/The-fDi-Report-2018/The-fDi-Report-2018. Government of India (2016), “India and Mauritius sign the Protocol for amendment of the Convention for the Avoidance of Double Taxation and the Prevention of Fiscal Evasion with respect to Taxes on Income and Capital Gains”, Press Information Bureau Press Release dated May 10, 2016 at http://pib.nic.in/newsite/PrintRelease.aspx?relid=145185. Goyal, Rajan (2012), “Sustainable Level of India’s Current Account Deficit”, RBI Working Paper Series No.WPS (DEPR: 16/2012, Reserve Bank of India. International Monetary Fund (2006), “Methodology for CGER Exchange Rate Assessments”, Prepared by the Research Department, Washington, D.C. International Monetary Fund. International Monetary Fund (2009), Balance of payments and international investment position manual, Washington, D.C.: International Monetary Fund. Jain, Rajeev, Dhirendra Gajbhiye and Soumasree Tewari (2018), “Globalising People: India’s Inward Remittances”, RBI Bulletin, Vol. LXXII, No.11, pp.45-55. Pagliari, Maria Sole and Swarnali Ahmed Hannan (2017), “The Volatility of Capital Flows in Emerging Markets: Measures and Determinants”, IMF Working Paper No. WP/17/41, International Monetary Fund, Washington, D.C.
Reserve Bank of India (2016), Annual Report 2015-16. Reserve Bank of India (2018), Annual Report 2017-18. United Nations (2009), System of National Accounts 2008, United Nations Organisation, New York. World Bank (2018), Migration and Remittances: Recent Developments and Outlook, Migration and Development Brief No. 30 (December), Washington, D.C.
World Bank (2019), Doing Business 2019: Training for Reform, The World Bank Group, Washington, D.C.
World Trade Organization (2018), World Trade Statistical Review 2018, World Trade Organization, Geneva. * Rajeev Jain, Dhirendra Gajbhiye, Soumasree Tewari and Anand Shankar, Division of International Finance, Department of Economic and Policy Research, Reserve Bank of India. The views expressed in this article are those of the authors only. 1 Based on monthly data on merchandise trade released by DGCI&S and net TOT estimates based on international prices of key commodities during H1:2018-19. 2 Non-produced, nonfinancial assets are assets that have not been produced within the production boundary, and that may be used in the production of goods and services (e.g., natural resources; contracts, leases, and licenses; and marketing assets and goodwill). 3 As of May 1, 2018. 4 With this protocol, India gets taxation rights on capital gains arising from alienation of shares acquired on or after April 01, 2017 in a company resident in India with effect from financial year 2017-18, while simultaneously protection to investments in shares acquired before April 01, 2017 has also been provided. Further, in respect of such capital gains arising during the transition period from April 01, 2017 to March 31, 2019, the tax rate is 50 per cent of the domestic tax rate of India, subject to the fulfillment of the conditions in the Limitation of Benefits Article. Taxation in India at full domestic tax rate will take place from financial year 2019-20 onwards (Government of India, May 10, 2016). 5 Including foreign currency convertible bonds (FCCBs) and rupee denominated bonds (RDBs). 6 AD Category-I bank: commercial banks, state co-operative banks and urban co-operative banks who are authorised to deal in foreign exchange involving all current and capital account transactions according to RBI directions issued from time to time. 7 “Others” under banking capital include movement in balances of foreign central banks and international institutions like the International Bank for Reconstruction and Development (IBRD), International Development Association (IDA), Asian Development Bank (ADB), International Finance Corporation (IFC), International Fund for Agricultural Development (IFAD), etc., maintained with the Deposit Accounts Department (DAD) of the RBI as well as movement in balances held abroad by the Embassies of India in London and Tokyo. 8 The gross external debt position equals total IIP liabilities excluding all equity (equity shares and other equity) and investment fund shares and financial derivatives and employee stock options (ESOs), allowing comparability across datasets (IMF, 2009). 9 This holds if the valuation effect and errors and omissions are zero over the period. 10 Net IIP is an integral part of the external sustainability approach used for measuring exchange rate misalignment by calculating the difference between the actual CAB and the level that would stabilize the net IIP position of the country at some benchmark level (IMF, 2016).